Here's a shot of the sculpt. She is buried in silicone right now. I'll do one version for Skulls club, and a second public version as well. Place Kiwi by your front door and rub her shell for good luck on your way out, put here in your restaurant for good health, or your shop as an anti-theft charm. MeMe are now complete. 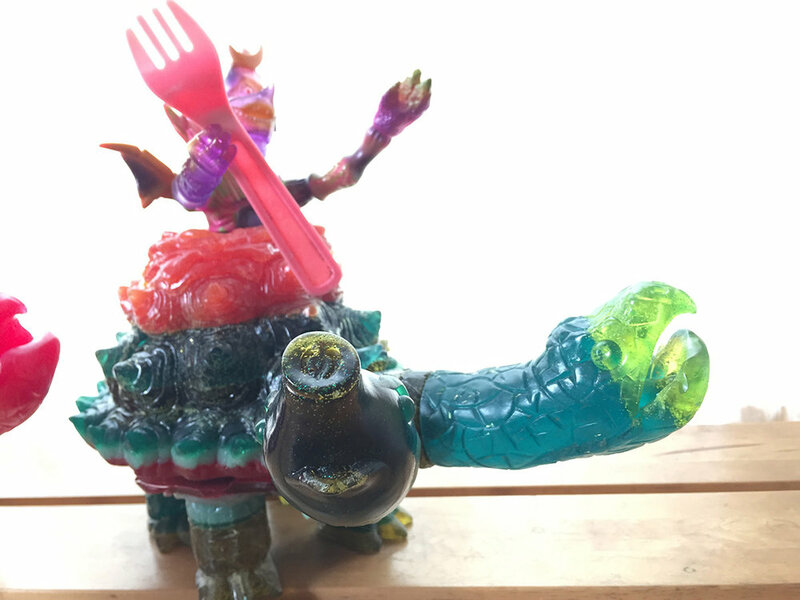 You still have a few hours to put your name in the hat for one of these beasts by Popsoda x Restore and one offed by Bwana Spoons. Scroll down the the "I still have three" post and put your name in there. Same price as first 4, which i think was $260. plus shipping. I'll double check. But as you can see. i still have my work cut out for me. Next Wednesday I'll have three more MeMe that I will sell by Lotto. Sign up here, in the comments section of this post if you want to put your name in the Randall mug. Same price. Similar style. Shipping. I haven't figured out how to do this. But I need to start sending anything to Asia-customs, or larger orders priority, with tracking, and maybe insured. I know how to ship this way, but need to make a new option on my site. The problem is that if i just say folks need to use the higher shipping price option for overseas orders, they will just choose the cheaper option anyways. But i don't want to penalize somebody from Taiwan just wanting to order a few Jungle Goobers:) I'll figure out something that works for all of us. This Friday I'll be opening up membership for 2018 Skulls And RainBones Society. This year I'm putting together some stellar packages for you. Is going to be quite delightful. Not these guys. They sold out. But a whole other bucket of DCON magic and new releases coming up in a few hours or maybe the morning of marrow. Oh sharts. So excited. Excited to see some of you folks. I'll be there all day Saturday and Sunday. And if you want a little more personal hangtime. Stop by Faceguts Friday after 5pm. i'll be playing Dice and helping Mr. Tim Biskup sell a big hunk of his toy collection, along with some new customs and of course. Dice! At DCON I'll have a brand new killer print, more new prints, a new tote and bandana, exclusive toys, original art, enamel pins, one-offs, and of course. MORE! Hi Gang. The happiest day is coming. Some folks call it Satan's Christmas. I just call it a perfect fall day. Friday 10am pacific. I'll have these beasts up on the Gravy webshoppe. Teenage Randall comes with a hunk of glee, a Teenage Randall howling at the moon print. Jungle Goobers are a perfect candy corn orange vinyl, and can be procured individually or as a set of three. Thee second half of my worldwin Leftcoast mini tour is almost upon us. We had a blast last Sunday in San Francisco at the world famous Zombie Garage. Now it's time for some more Slow Your Roll action at Faceguts. This Sunday September 24th. From 12:01 - 1pm will be an extensive 3 minute talk on the biology and folklore of the Kappa. After the exhaustive Kappa lecture we will all sit around and draw Kappas after a quick tutorial. Then at 1:01pm till 6pm, the floodgates open for sales and together time, and some beertime. Myself, Liverad Studios, and friends will have a small motherload of exclusive toys, prints, tees, pins, prints, and original art. Come play with us Los Angeles. Faceguts is located at 4136 and a half Verdugo Rd. Los Angeles California 90065 Folks who attended the recent Gravy Open Studio in Portland, and Zombie Garage in San Francisco can testify to a good time had by all. What is required? If you come at noon. A sketchbook and some pens and a pencil would be a great idea. But if you forget I'm sure we will have you covered. After 1pm it's just you and your 17 friends you bring thru the doors. Who can come? Bring your kids and you grandma. They are both invited ,as well as you. What does it cost? Nothin'. The Kappa workshop is free. Just bring your good vibes. If you are planning to buy some goodies. Cash is great, and I always happily take Paypal. I can't wait to see you this Sunday. Friday 10am Pacific here on Gravy. Drizzleshits. Ridiculous Amount Of Shards. Edition size is 13 (I think. I'll double check today). This comes with a signed and numbered Drizzleshits "Shards" still life, print on archival bamboo paper. Getting warmed up for a Reelly exciting week. Took this pic last evening. yesterday it finally rained, at least a little. And my spirits were high as I thought about all the excitement coming up this week. Where to start. Well, first let's start with THANK YOU. We sold 30 Mystery Boxes. The Mystery Box was a fluke. I'll explain more below. I wasn't sure how these would do. But these went beyond my expectations. this means that close to 30 people (a few people ordered two) are getting some grade A tees that have been just sitting in storage for a long while. And close to 30 people just got a smoking package deal. I can't wait to go through toys today and sneek in some customs and other goodies for these boxes. Let's do this again next year same time. Now this week. It's a double wammy for sure. Don't they say No Wammies". Friday at 10am I'll be having a PK painted run release into the wild. We will do this by lotto, as any good sensed PK release should be. to put your name in the hat sign up here in the comments section of this thread. there will be a painted Ree run, painted Quatroid Run, a one off Goboking, and one original painting "Bloodbath". you can put your name in for everything. But preference will be given to those that haven't been picked yet. I'll start with the custom Goboking, and then do the Rees, and then Quatroids. I don't have a real price list yet. But here's an estimate for what your into. Ree will probably be $200, PK asked that I do a full kit, mushroom, spacesuit, and oriGINal, so it's a LOT of parts. Goboking one off will probably be $360 - $500, and Quatroids will be $36 - $40. Hope this helps. At 10am friday I'll have all the names in the Randall mug and start drawing. Goodluck and haves funs. Ok. next point of interest. Open Studio Yeah! 3-8pm this isn't at the brick and mortar shop downtown. This will be held at my real studio here in SE Portland. More detailed post about this tomorrow. and lastly. kickstarted gets bumped again. I'm shooting for next friday. The real reason we are having a double wammy this week, the mystery boxes earlier, and have to bump the kickstarter. I overdid summer, and busted up my back pretty good. Old man Spoons. A week out from the initial backlightning and I am still struggling, but each day gets better. My range of movement gets better, and I am moving just a little quicker. Barf. i hate even talking about that kind of stuff. I am feeling very grateful that I can move again, and so excited for this week. August schedule with a slight chance of fun. Rando photo. But I think this might sum up summer pretty well. If you think this face is goofy. You should see what my ocean face looks like. Friday August 4th Watermellon jungle boogie Steven. Friday August 18th Open Studio. Yes…. My first ever open studio. More info soon. Friday August 18th PK Reely fun release, and the Gravy Toys Megaload Kickstarter begins. That’s it for now folks. I’d love to to a blogger SD recap, just need to find the enegy to get it going. Quickie sale this weekend thru Monday morning. Get 25% off an any orders over $100. Combine a pile of small bits, or pick up that sexytime custom or piece of original art you were hunting for. Folks that have outstanding orders will also get a little something nice in your box too. use coupon code FUNZONE at check out.